There are several classes that implement common dialog boxes, such as color selection , print setup etc. 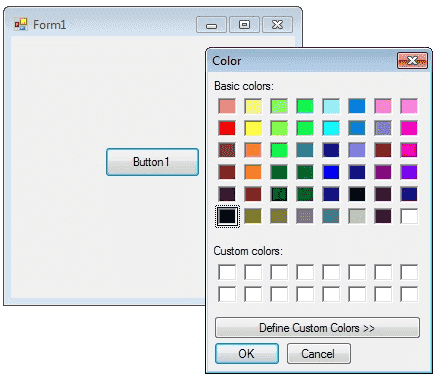 A ColorDialog object is a dialog box with a list of colors that are defined for the display system. The user can select or create a particular color from the list, which is then reported back to the application when the dialog box exits. You can invite a color dialog box by calling ShowDialog() method. The following C# program invites a color dialog box and retrieve the selected color to a string.